The Stanford-Research SR570 is available to buy refurbished used or rent, usually from our UK stock. Click here to download the Stanford-Research SR570 datasheet. The SR570 is a low-noise current preamplifier capable of current gains as large as 1 pA/V. High gain and bandwidth, low noise, and many convenient features make the SR570 ideal for a variety of photonic, low-temperature and other measurements. 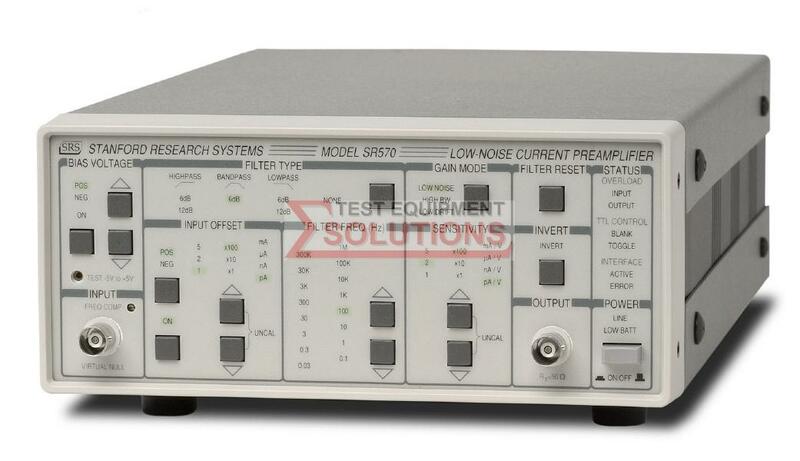 We offer the refurbished used SRS SR570 Low Noise Current Amplifier for sale and rental. The Stanford-Research SR570 is fully tested and refurbished in our in-house ISO9001 calibration laboratory. We supply manuals, accessories, full warranty and a free-of-charge Certificate of Conformity. We can also provide the Stanford-Research SR570 with a fresh calibration for a small additional charge. If you have under-utilised test equipment talk to us about trading-in or part-exchanging it towards the Stanford-Research SR570 or other refurbished test equipment.